PHOENIX – August 13, 2015 — Sysazzle, Inc., a Phoenix-based recruiting company working in the health IT, tech, and federal, state and local government space, has been named to the Inc. 5000 roster of fastest growing companies in America for the third year in a row. 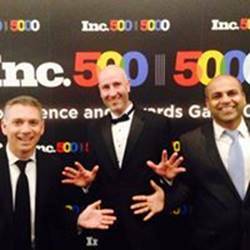 The Inc. 5000 is a prestigious list of the fastest-growing privately-owned companies in the US. With an international workforce and several offices in the US as well as in Indore, India, Sysazzle enters the 2015 Inc. 5000 list at number 2,878, boasting a three-year growth record of 124%. Sysazzle is a specialized technology staffing firm that provides a higher level of service than other staffing firms. With 68 employees, Sysazzle is a dynamic team of professionals who are able to meet your staffing challenges through our experience working with domestic and international business, technology and product companies; consulting organizations; non-profit associations and organizations; international law firms; and government agencies at the local, state and Federal levels. Inc. Magazine is the only major business magazine dedicated to owners and managers of growing private companies. The Inc. 5000 roster helps business leaders get a deeper understanding of the entrepreneurial landscape. Sysazzle will receive its award at the Inc. 5000 Conference and Awards Ceremony, which celebrates the Inc. 5000 and allows honorees, alumni, and entrepreneurs to learn and network, in Orlando, Florida in October. With offices in Phoenix, Los Angeles, Houston, Washington DC, and Indore, India Sysazzle, Inc. is a certified woman-owned business helping key executives decrease or completely eliminate the burden and risks in hiring world class personnel.